A few weeks ago, we put together a little gift guide for the special women in your life over this festive season. But let's be frank; buying for a woman is so much easier than buying for men! 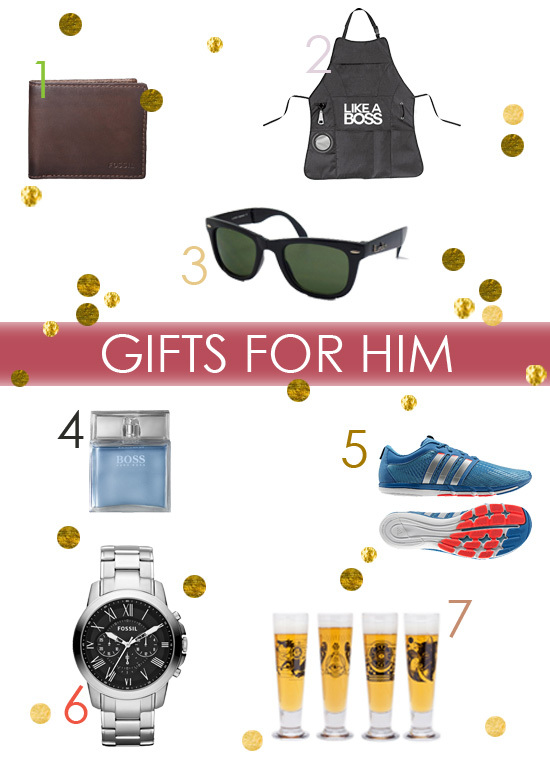 So to ease any pre-holiday anxiety over what to get for you husband/boyfriend/dad/brother, look no further than this gift guide. We've sourced some local goods and few solid basics to help you out! 1 // A new wallet is always a great gift if your man has been lugging the same around for a few years. We love the look and affordability of this brown leather bi-fold wallet from Fossil. It comes in Dark Brown, Red and Olive and at only R399, it's a steal! 2 // We love the candid humour of this 'Like a Boss' braai apron. The perfect stocking filler for dad. This nifty apron isn't all fun and games though and comes with a padded oven mitt, bottle opener on retractable cord, cleaning cloth and a PVC lined drink compartment. All you need to braai like a boss. R299 makes is all yours. 3 // Make sure the one you love is right on trend with these useful fold up wayfarers. They're in fashion, and fold-up means they can be tucked away, hassle free into a pocket. At R119 what more is there to think about? 4 // We love any fragrance by Hugo Boss and this one is no excpetion. For a light, fresh scent (perfect for hot summer days) look no further than Hugo Boss Pure. Available at most department stores. 5 // Why not treat the athletic man in your life to a new pair of training sneakers? These Adidas Adipure Gazelle Shoes are perfect for running and the gym and will definitely make someone very happy. Find them at any Adidas shops or sneakers outlet. 6 // If it's a new watch you're on the market for, you should have a look at the latest range offered by Fossil. We simply adore this Grant Stainless Steel Watch and it comes in at a great price of only R1999. 7 // Have a little fun with these one of a kind Spookasem Beer glasses. A set of four is R329. We love the detailed illustrations on them - they are sure to be conversation starters if they're stocked in any bar. Find them here.